One Sunday the Warmonger and I were driving through the Savannah airport when I noticed this airplane. It's not often I see a totally unfamiliar plane, and this one certainly got my attention. We pulled in to check it out. 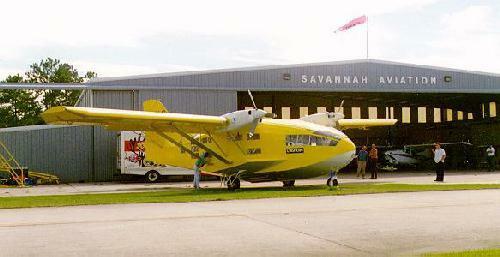 Mary at Savannah Aviation told us this was custom built built for filming documentaries around the world. It was here to be dismantled and shipped to Australia for its first job. After a while they loaded up and went flying. The two 300HP engines started instantly and ran unusually quietly. This thing has more windows than Microsoft! This is a definite widebody. I got the feeling they will be living aboard at times. 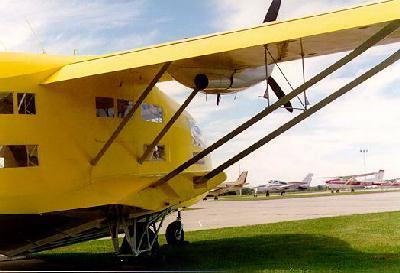 When retracted, the nose gear projects ahead of the hull as a bumper for water operations. Since the film company is French, the design takes its cues from the Eiffel tower. All these struts allow a long and slender wing without a big spar running through the cabin. The interior is about the size of your local Wal-Mart. 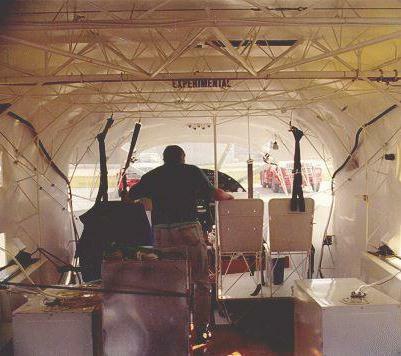 Most seaplanes look like an airplane inside, this one is definitely a boat. You'll have to excuse the housekeeping; they were in the process of packing up for down under. 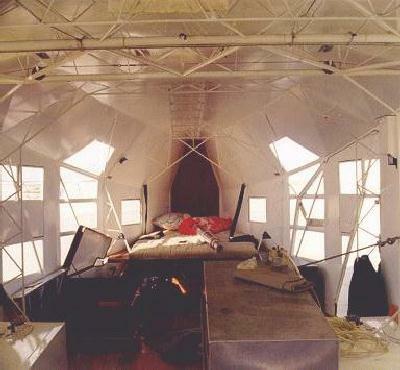 The raised cover to the left is over a floor panel in the rear, just forward of the bunk, which allows an underwater view, like a glassbottom boat. The Warmonger has built a Flight Simulator model for this unique aircraft.